I wonder what RS thinks of his fans. He seems pretty accessible to them, with the meet-and-greets, sound checks and fan appreciation vacations. And he has said in interviews that he really appreciates them now even though he may not have as much in his younger days. And, as documented in the documentary “Affair of the Heart,” it definitely seems genuine. But I wonder what it must be like to have that type of celebrity – to have the realization that if you’re having a bad day and snap at somebody, it will permanently cloud their judgment of you forever. And if your name comes up in a future conversation, they’re likely to say, “Oh yah, I met him once, what a jerk.” It’s not fair but it’s human nature, I guess, to have different expectations for celebrities, as if they should be infallible. And even on the other extreme: Imagine how tiresome it would be to arrive at your office each morning to be greeted by a crowd of people snapping pictures of you that will be posted all over the Internet in the next 10 minutes. Even if the swarm was filled with admiration, I’m sure there must be times when it becomes too much. I guess that may just be the “price” of celebrity that goes along with making millions of dollars for doing something you love. Social media has changed the relationship of celebrities with their fans, too. (Here’s an interesting article on “super fandom.”) Not only does it allow for a direct line from a celebrity to his or her fans (and maybe the opposite direction, too), but also from fans to one another – such as on Facebook fan pages. RS fans are a very devoted bunch. It’s very apparent from reading through Facebook posts and searching #rickspringfield on Twitter that he has many admirers. (I hear there are even blogs devoted to him…) Does it ever freak him out a little? I wonder if he ever reads through his fan pages to see what they’re saying and, if so, what he thinks about it. 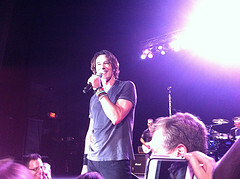 OK, so it was more than seven hours straight of Rick Springfield songs. To anyone out there who thinks of him as a one-hit wonder: pffft. What was really cool about this evening was the mix of songs, from the 70s to 2012 plus the I-know-every-single-word-of-this- song ones to the ones I’ve never heard before. Thanks to those at Rick Springfield & Us for being such a great resource for lyrics and to find which songs were on which albums. The number of songs written by RS – in so many different styles – is so impressive. With DVRs, Netflix and the plethora of ways for people to get their entertainment these days, all too often people only share moments with those in the room rather than it being a collective experience. I remember as a kid going to school and discussing whatever show or movie was on TV the evening before. It’s much more rare to do that today because there is probably someone in the room who DVRd it and hasn’t watched it (“spoiler alerts” didn’t exist back then). Rather than everyone sharing something enjoyable, it seems that it’s all the distressing news that generates conversation now because it’s only the breaking news we all hear at the same time. So it was nice to share something so positive with people around the world who also enjoyed the same thing. It was also interesting to hear from author Lisa Cownie and photographer Kris Fluck of the new book coming out in 2015: “Sharing the Stage: The Journey that Brought Us Together.” It really is incredible how many people RS has inspired (and how many songs he has written)! Our lives are ruled by assumptions, which is necessary to get through the day. The sun will rise in the morning and set in the evening – except perhaps in a polar circle but there your assumption would change anyway. When I was in New York visiting my cousin in December 2000, I made choices based on my assumptions, choosing to visit Strawberry Fields and the Dakota Apartments instead of the World Trade Center, assuming I’d get a chance to visit the latter during a future visit. Although I didn’t know him well, we’d hang out when he was in town visiting my friend and he was one of those people that lit up a room and he was so funny and kind. Sometimes months or years would pass until we saw him but when we did, it was like he never left town. I always assumed that we’d see him again. As I looked at his smiling Facebook profile photograph, I thought back to some of our past conversations – and remembered only fragments but couldn’t recall any strong indications of an inner struggle. But isn’t that usually the case? Those kind of feelings are easy to hide from those you only see for a few hours every couple of years. But it is a reminder that we shouldn’t take things for granted, and a reminder that things aren’t always as they appear. Maybe all the smiling holiday photos on Facebook are truly happy or maybe it’s just one smiling snapshot between difficult moments. We don’t know for sure. I recently heard about a new project that a RS fan is working on that sounds so interesting! Lisa Cownie is a journalist who had an assignment to interview Rick Springfield (how do I get an assignment like that?!) and ended up talking to members of his band and learning about their stories. Two years later, these stories are the basis for her new book “Sharing the Stage: The Journey That Brought Us Together,” which is scheduled to come out in March 2015. Oh, and the photographer, Kris Fluck is a RS fan, too – she’s the creator of WeLoveRickSpringfield.com. Due to personal reasons of the band members, the author has decided to hold off on publishing the book. See her explanation here. On one hand, it’s too bad because she has spent so much time and effort on this project and I’m sure it would have been wonderful but, on the other hand, it’s totally understandable why the band members are hesitant to divulge that much information about their personal life at this point. A note to the author: You should be proud of the work you’ve done and I admire your integrity in respecting their request. Best wishes on your future endeavors! Since I have “rediscovered” Rick Springfield, I’ve been listening a lot to “Venus in Overdrive” and “Songs for the End of the World.” For the past few weeks, it’s either one or the other that is in the CD player in my car so my kids have been listening to them often as well. I have three sons, ages 4, 6 and 8 and they have all quickly become familiar with Rick Springfield. When I first started playing “Songs for the End of World,” my 8-year-old asked who was singing and I showed him the cover. “Does he look familiar?” I asked him. “Yes,” he replied. “From ‘Late, Late at Night,’ ” which he had seen around the house. My 4-year-old has been heard singing, “Victoria’s seeeecret” and “Awaaay, awaaaay” (from “One Way Street”) around the house. He’s also picked up a few new vocabulary words (such as the one in song number 9 mentioned above) so I skip over some songs when they’re in the car. (When he first used that word, I asked him where he heard it – he replied, “from Rick Springfield.”) I always skip “I Hate Myself,” because I don’t want them walking around singing that. One funny coincidence: last weekend I was home alone doing some work and was listening to a podcast of a RS interview from June on the computer that somebody had posted on a RS fan Facebook page. It was a fun interview during which RS and the interviewers were joking about the number of records RS has sold and at one point joked that they could say there were trillions of them. A couple of hours later, I was in the car with my oldest son and out of nowhere he asked me, “Does Rick Springfield have billions of songs?” (He hadn’t heard the interview.) The timing was just weird because the interview was still in my mind. This week there was a thread on a RS fan page where people shared their RS stories – when they became fans, how aware they were of RS in the ’90s and how they got back to this point (on a RS fan page). It’s pretty incredible to learn about the impact he’s had on so many lives. The passage of time is such a funny thing. In an interview with RS that I heard recently, he mentioned that at this point he’s lived in the U.S. longer than he had lived in Australia so this feels more like home now. But since the 80s when first becoming aware of him, I’ve always thought of him when I hear something about Australia. I guess it’s kind of like when you think back to a certain time in your life and you think of the people as you knew them rather than who they are today – such as when I see pictures of the preschoolers I used to teach when I was in college and have difficulty grasping the idea that they’ve grown and likely have children of their own. Although, this is probably different now with Facebook and similar social media when people keep abreast of people’s lives long after they are no longer an active part of them. Anyway, when I was reading these fans’ stories, I couldn’t help but think of a young Richard Lewis Springthorpe so many years ago who had no idea what his future was and feeling so bleak about what those possibilities might look like. While he was distressed about his relationship – or lack thereof, as he describes it in his memoir – with girls, he probably could not have fathomed the depth of his success or his impact on people’s lives. “Don’t worry that none of your female classmates seem interested in you, Ricky boy, someday women will be making calendars out of your photos and paying a few hundred dollars for the chance to meet you,” a time-traveler might have told him, if one was able to travel back in time. Enough with the “Jessie’s Girl” references! Rick Springfield is so damn cool. He (or his social media rep, who knows?) tweeted today about his newest project. In just one year, he’s toured around the country during rock shows, storytelling concerts and book signings and filmed a movie; now he’s shooting a HBO series. When the hell are people going to stop with the “Jessie’s Girl” references? That was 33 years ago! He has recorded more than a dozen albums since then with so many other great songs, written a memoir and a novel that both made it to the New York Times Best-Seller List, acted in numerous TV shows and just filmed a movie with Academy Award-winning actress Meryl Streep. And he’s the father of two sons and just celebrated his 30th anniversary with his wife. Sure, he’s had his difficulties and challenges – doesn’t everyone? – but his perseverance and stamina is truly inspiring. Now that the main cast for the second season of HBO’s “True Detective” has finally been confirmed, fans may be wondering who else will pop up on the anthology series. If you guessed a former ’80s pop star-turned-actor, you’d be right. Do your homework, guys. Ever heard of Google?